Friends think we are lucky to avoid the cold Canadian winters and they know we are in the jungle in the middle of a National Park in Central America. It often prompts the question, “What do you do for Christmas?” Some feel that for Christmas we are alone and isolated. 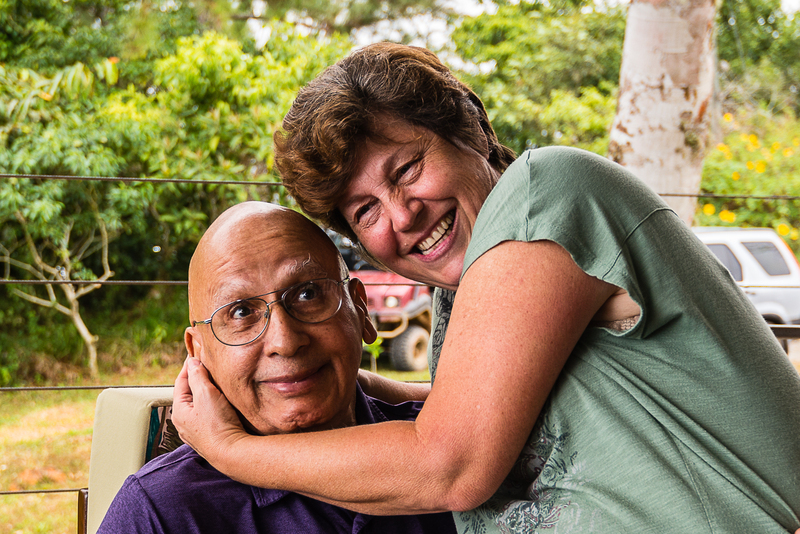 Well… this is not the case so I thought I would give you a little rundown of what we, and others, have been doing this Christmas in our little Panamanian mountain community, Los Altos de Cerro Azul. It also gives me a chance to show you some of the photos from my very busy camera. This year the season began with a regular event. Each year just before the Christmas season, with the help of our local branch of the Vecinos Vigilantes (Neighbourhood Watch), people in our community gather used clothing for distribution to those in need from a little remote community further up the mountain called Altos de Pacora. The donations hauled to the community where the local school helps in the distribution. Another recurring event is the gathering of cash donations by one of the residents, for distribution to the Security Guards and/or Club Staff. These folks spend their life aiding us by keeping us safe and fed at the small club restaurant. They don’t earn much in wages so a bit extra is helpful at Christmas. A few days before Christmas, one of our Pot Luck dinners was hosted by one of the residents. This approach is the usual way we residents get together. The food is always amazing because people make and bring things that are their specialty, and people here are from all over the world. Here are some photos from this event. 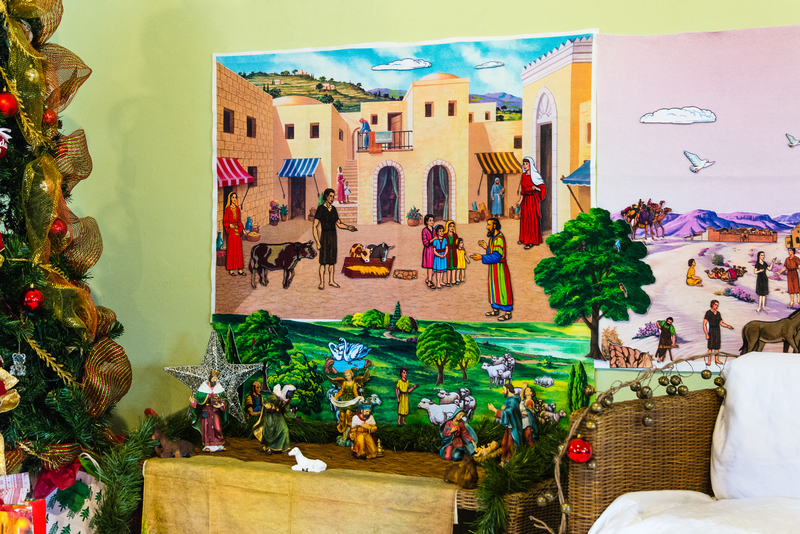 On the 23rd, I had the privilege of shooting the Children’s Christmas Pageant at Gamboa Union Church in Gamboa, right on the Canal about half way through. (http://gamboaunion.com/). 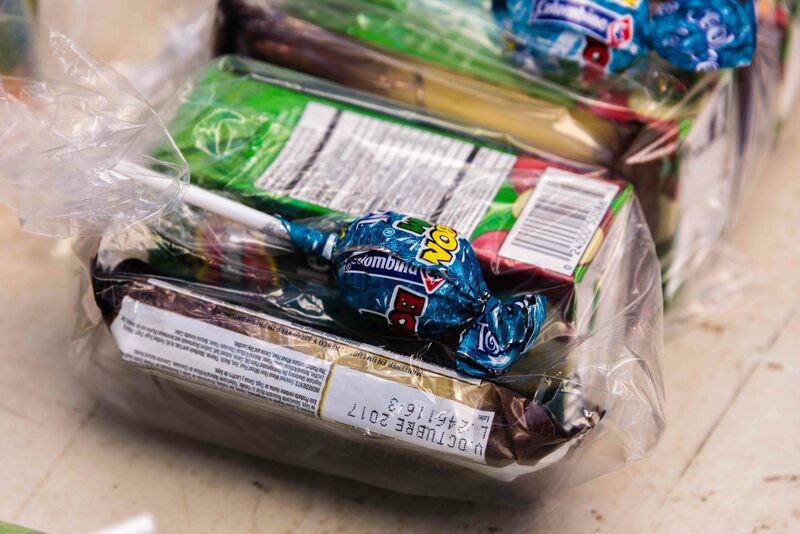 This is an annual event that includes the distribution of food to a group of Indigenous families who attend the church from San Antonio Island. Here are some photos for you. Later that day, we attended another regular event. Each year friends of ours host a Christmas party and dinner for some of the workers of the community and their families. 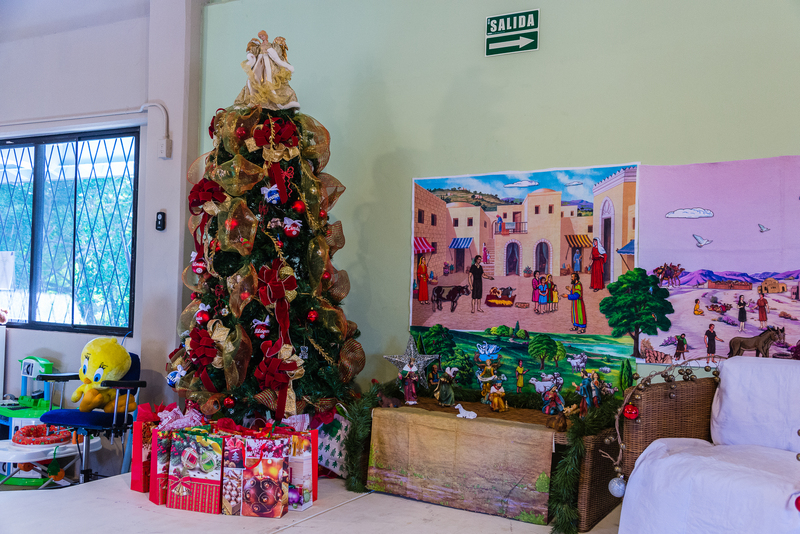 Each child receives two gifts, one piece of clothing and one toy. Most of these people have a low-income so it is great to see the expressions on the kids faces when they get a gift. Oh, and another scrumptious meal. Here are a few of the photos. 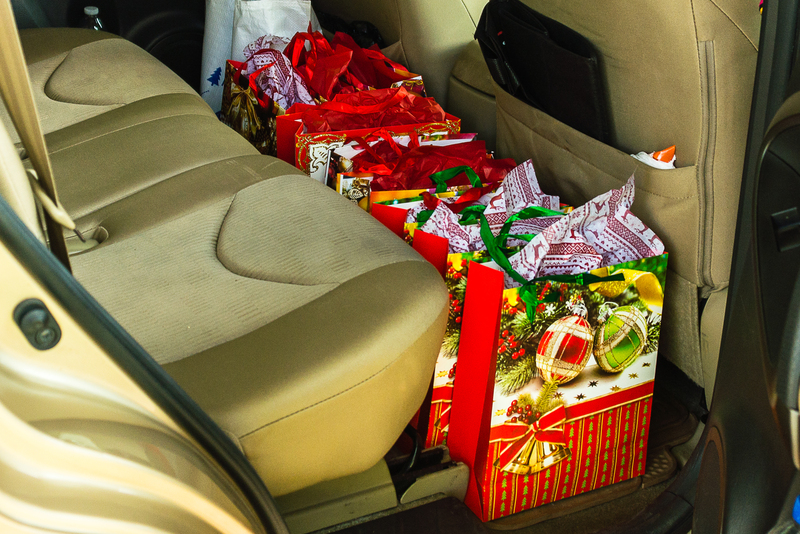 The next day, on Christmas Eve, we decided to take a load of presents to a very special place in Colon so we loaded up our Toyota Santa Waggon and headed north. 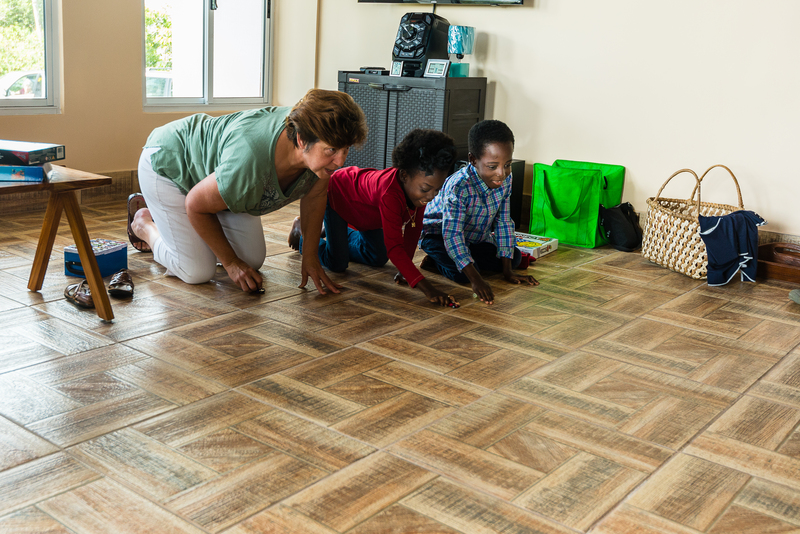 Casa Providencia (https://www.heartscrychildren.com/casa-providencia) is the only orphanage in Panama for disabled kids. I was able to shoot the grand opening last March while we were here. Oh… I just realized that I never posted the photos from that event! Will have to catch it up for you while we are here. Anyway, there are now nine “Casa Kids” at the orphanage. There will be 55 once they are at full capacity. We just thought it important to make sure those special kids had something for Christmas. We stopped on the way to pick up a little something else that all the kids love… ice cream. Note that I have not included any photos of the kids as their privacy is mandated. Our little run on Christmas Eve was to be a leisurely trip to the orphanage in Colon, followed by a nice dinner at the Rainforest Resort in Gamboa, followed by a candlelight service at our church, then back home. The plan forgot to include the fact that plans in Panama often go awry. About half way to Colon we spotted an accident in the opposite direction we were travelling. The police had closed the southbound toll road completely and we passed miles of parked cars waiting to get through. Further up the road, we noted that the police were routing all the southbound traffic to the old highway. After our stop at the orphanage, we got to join the lineup for the 50 kilometer trip back to Gamboa, at parking lot speeds. We missed dinner and made the church just in time for the service. Christmas Day had us hosting our third Christmas Day Brunch from 11:00 til 15:00. It was a total success with thirty-one people attending. Again, the variety of food was amazing and it was good to see people hanging around and visiting with each other throughout the event. So that is what Christmas is like for us here in Panama!. I wouldn’t say it was at all quiet and restful but there will be lots of time after Christmas to catch up. We hope you had a Merry Christmas and will have a Happy New Year. Also, a big thanks for following our little blog. We are back in Panama for another season of cold weather avoidance and tropical living. 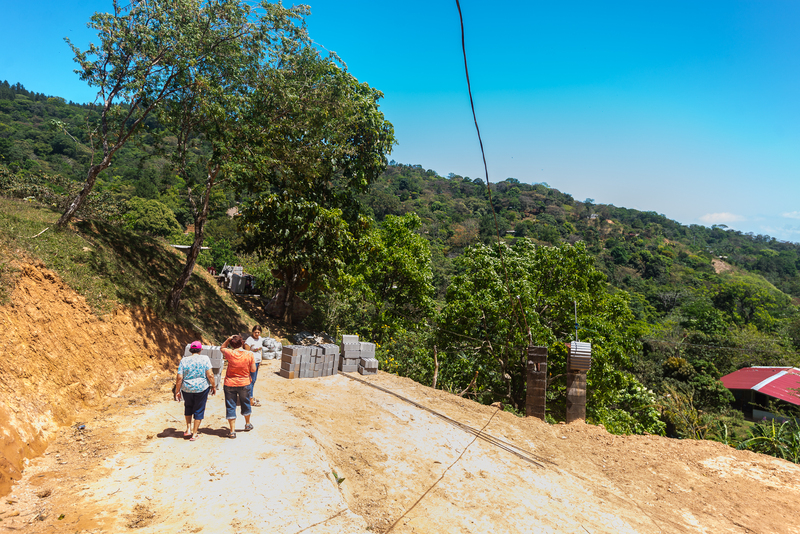 Our house in Los Altos de Cerro Azul is progressing nicely, in fact, this year’s only project is the last of the major inside projects. We plan to install about 1,200 sq. ft. of interior ceilings! 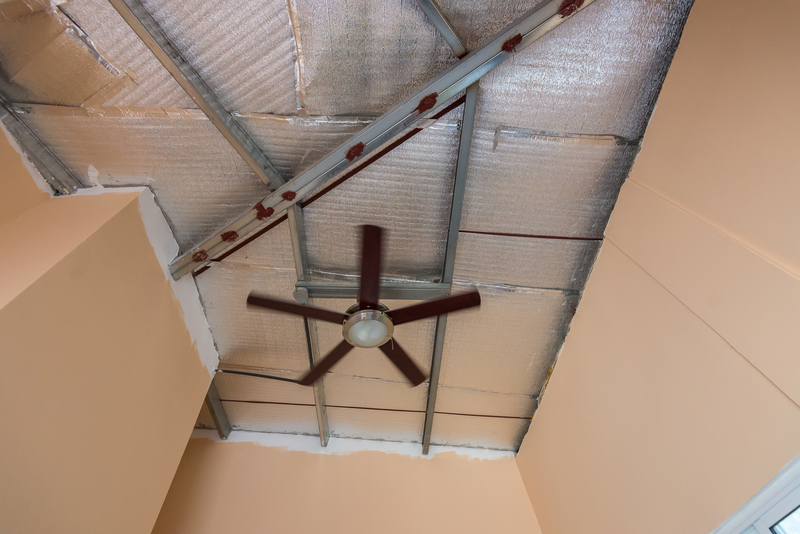 As I have said before, humidity is our biggest problem here and we are careful to select appropriate building materials that will stand up to humidity in the mid ninety percent range. At home, the standard gypsum board would be the natural choice but here, it would disintegrate in the humidity. We have found plastic very durable in this environment. We have several dressers and cabinets made from plastic and they look reasonable and do not mould. A couple of years ago we found a new ceiling material in the stores here. It is PVC plastic. If you hold it up and look at the end, it resembles the structure of heavy cardboard. It is about ¼ of an inch thick. The dead air space inside it also will offer some added insulation. We decided on this material for our ceilings. 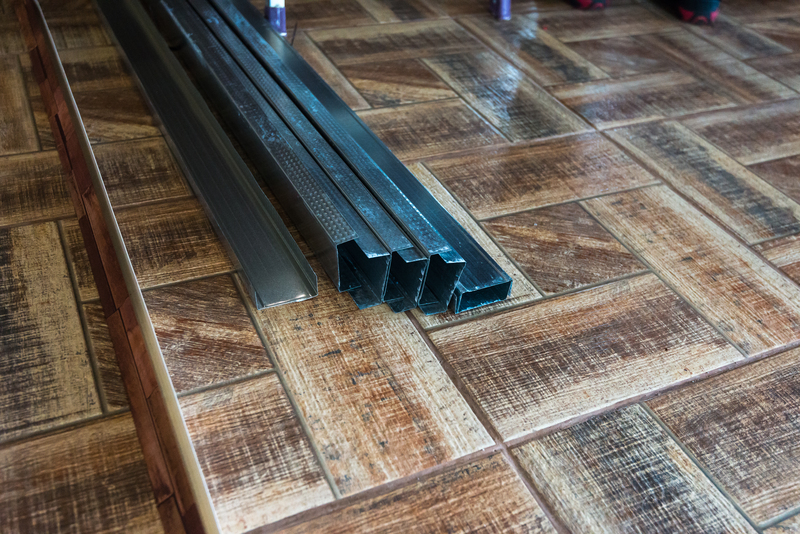 As this product comes in many different finishes, patterns, and colors the next job was to make the rounds of the building stores to find something that we liked. In keeping with our wood theme, here is what we settled on. It looks like the next thing we need to do is decide on how we want the ceiling installed. Most places we have seen using this product have followed the inside of the roof line. In our case this presents some difficulties due to the steel structure supporting the roof. It would not be a symmetrical installation. Finally, we decided on a simple flat ceiling. Simple! We also have a high enough roof that we will be able to make an eleven foot ceiling. This allows for lots of air to circulate, which helps keep things cool in the heat. Some of the installations we have seen are pretty rough. Particularly on mouldings in the corners. We hoped that by opting for the flat simple solution we might decrease our risk of problem corners. 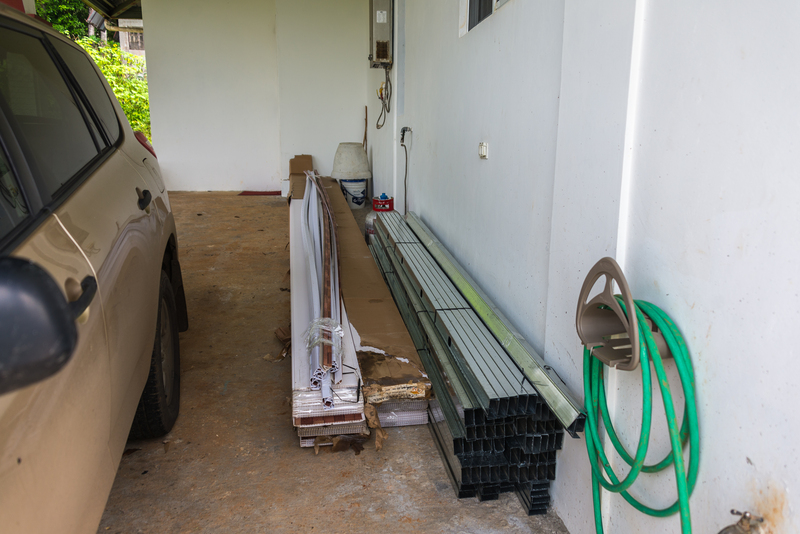 Next, we had to find an installer so we talked to a local contractor we knew and asked him to bid on the job. 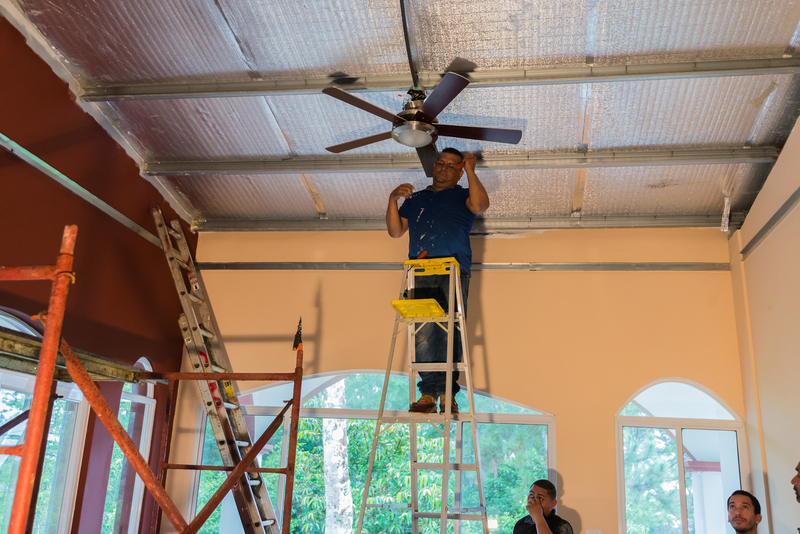 The surprising result was that he had located a four-man team with lots of experience installing this type of ceiling. 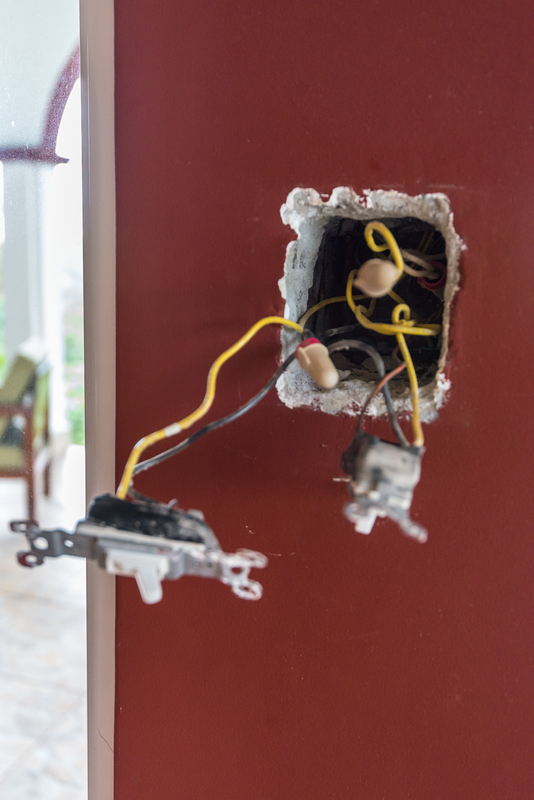 This contractor is also an electrician and we needed to adjust some of the lighting. Our existing lighting was simply mounted in a junction box attached to the roof beams. These junction boxes needed conversion to distribute the wiring to new LED fixtures mounted in the ceiling. In retrospect, this was a great approach as we had a couple of years to consider what lighting changes we would make to improve visibility. The start date was quick so we had to get our choice of PVC, track, and studs not only bought but hire a truck to pick it up and transported everything to our house up the mountain. We hired the same truck that brought the ceramic tile for our outside deck up last year. The promise was that this whole job would take five days. The plan was for them to start at 7:30 in the morning and work as long as possible. Our experience up here suggests to us that this would be more a hopeful plan rather than an actual one. 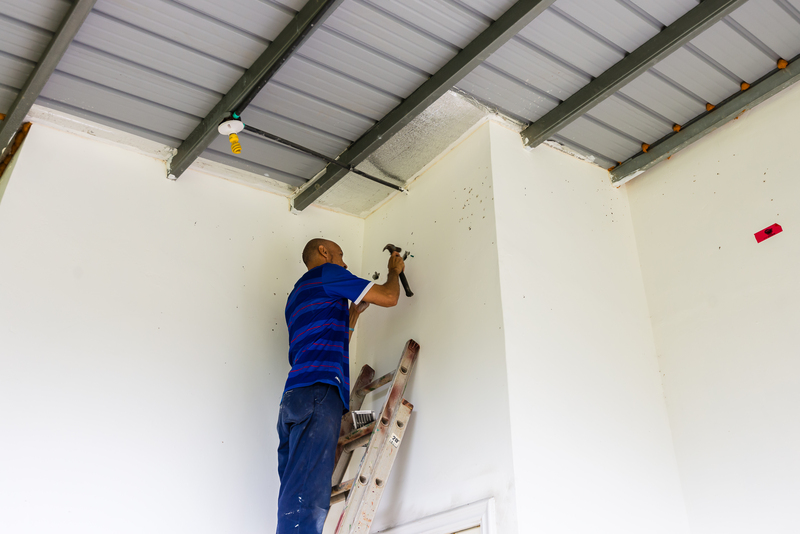 The process to install our ceiling involves installation of the studs first. The studs look like steel studs open on once side. They are light weight galvanized sheet metal. They put a level chalk line on the wall then shoot a nail through the studs into the concrete wall with a nail gun. 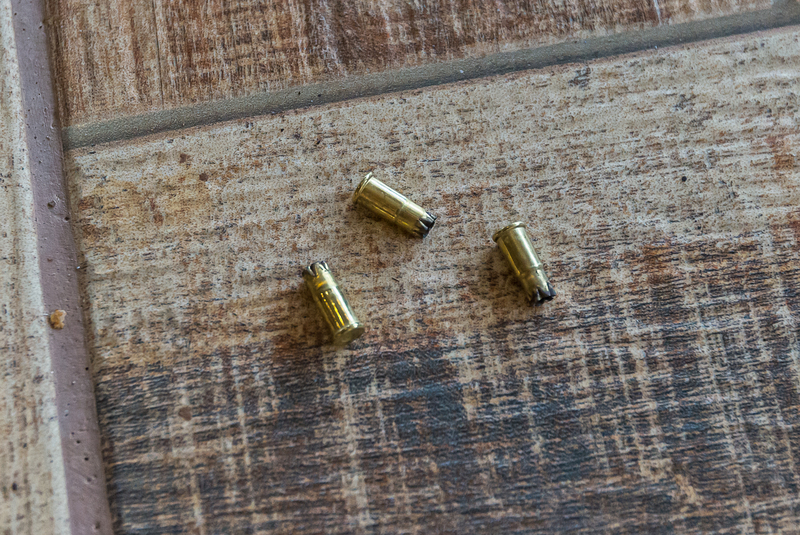 LOUD… as they use .22 calibre blanks to drive the nails. They circle the room with the studs then begin to install tracks. The work went well with two guys up the scaffolding installing and two guys on the ground bringing and sizing material. Tracks are similar to studs but have holes in back of the material to cut weight. Tracks run across the room then more tracks come from the roof structure down to the horizontal tracks across the room, supporting everything and making it level. 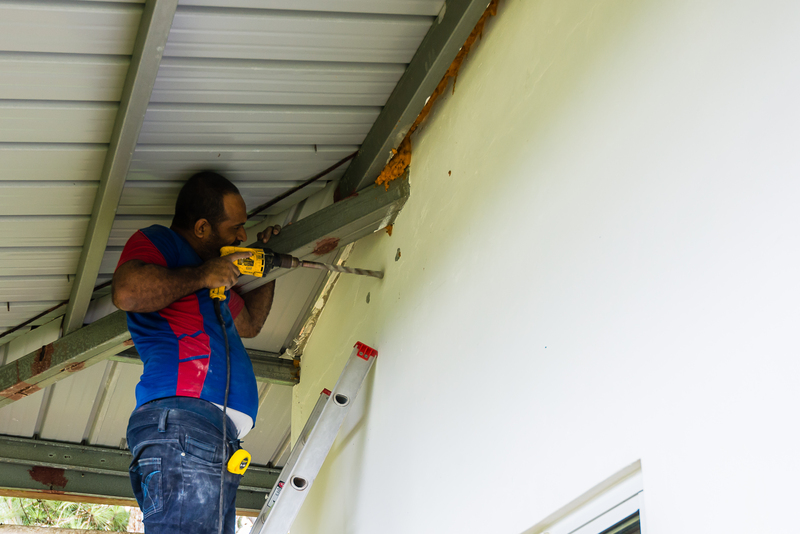 The dirtiest part of the job was the drilling of holes in the concrete wall between the new ceiling level and the existing roof. This is for ventilation. If you don’t do this the air between the ceiling and the roof is trapped and the humidity will have no way to escape. This will result in condensation, mould, and odor, none of which we want. 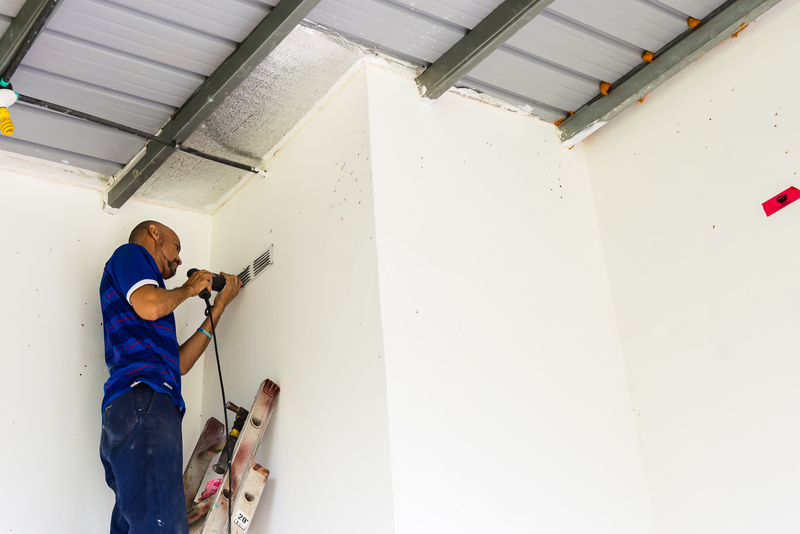 After the room has studs and tracks completed, the next step is to screw the edging pieces to the bottom of the studs using self-tapping sheet metal screws. 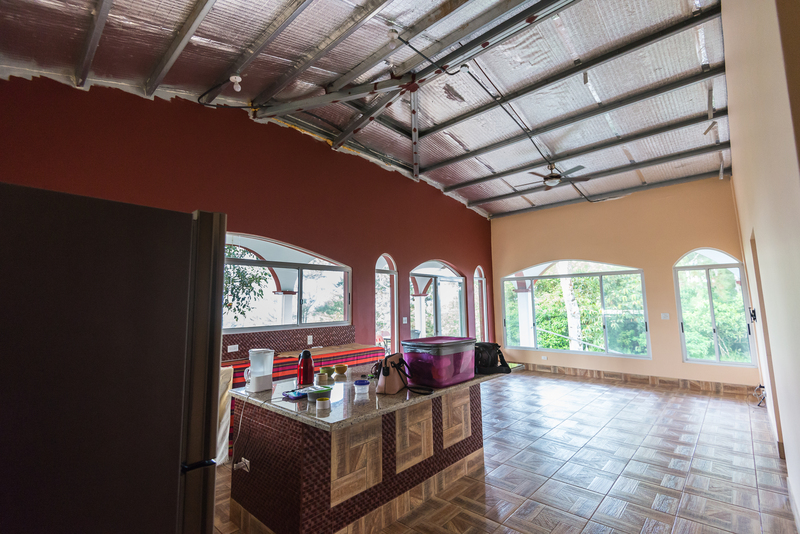 Once the room is complete, the actual ceiling is installed. The guys on the scaffolding measured the needed length and the guys on the floor cut the piece to the correct length. 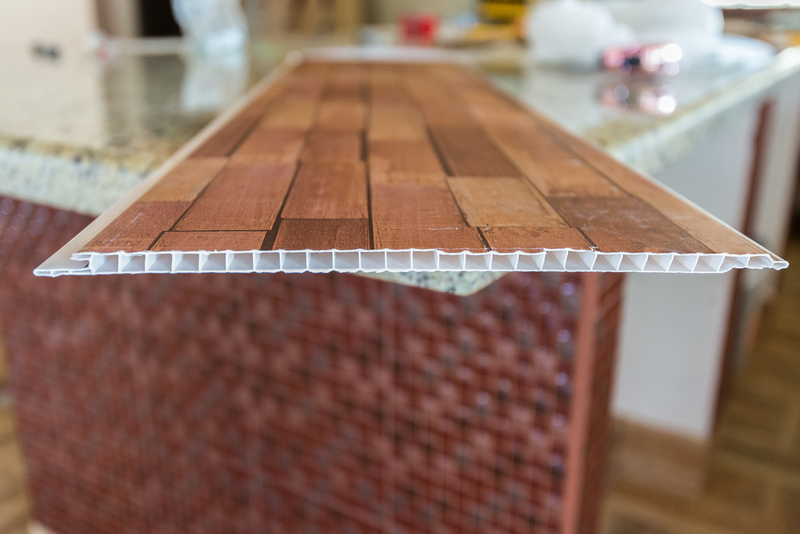 Our ceiling material comes in about nineteen and a half-foot lengths. 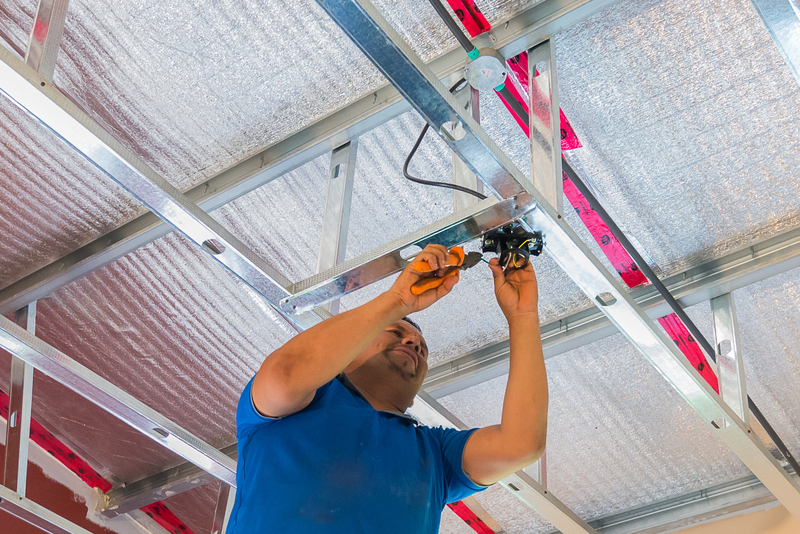 The two ground guys deliver the cut piece to the scaffolding team, who insert the ends into the edging piece and slide it up to the previously installed piece. Two ceiling pieces snap together on one side, similar to laminate flooring. The open side is screwed to the track, using self-tapping sheet metal screws. 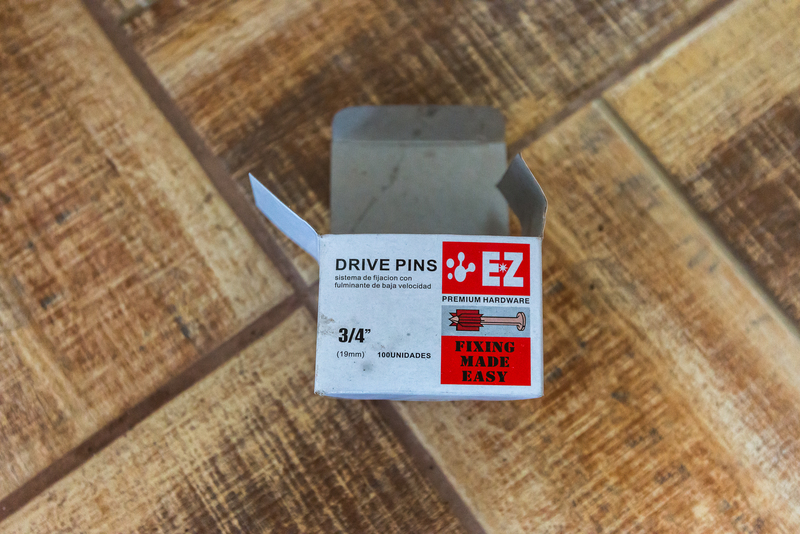 Every piece is secured this way except the last piece which is the most difficult to install. It snaps into the earlier piece but is left loose in the corner moulding on the side normally screwed. Done right, you cannot see any difference. All in all, we found the job quality and hours worked above expectation. Some evenings they would work until six or seven at night, after starting at around at around 7:30 in the morning. They brought lunches with them but barely stopped for fifteen minutes to eat. No breaks! The last night they were here until nine. They completed in five days, as promised! Here in tropical Central America, we have two distinct seasons, wet and dry. The wet season, from about April through November, generates humongous amounts of water! A good rainy season is essential to the water supply to keep the Panama Canal working through the dry season. It is also the growing season. 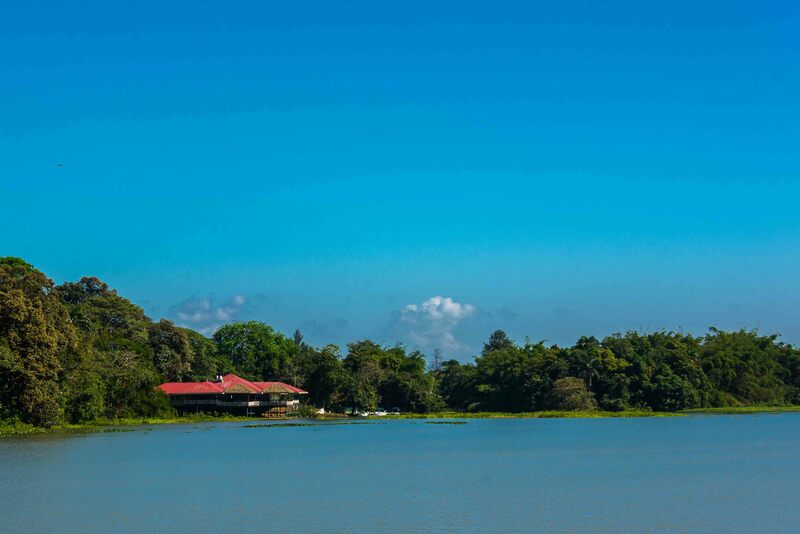 The abundance of water makes everything so green that it grows at slightly slower than the speed of light! 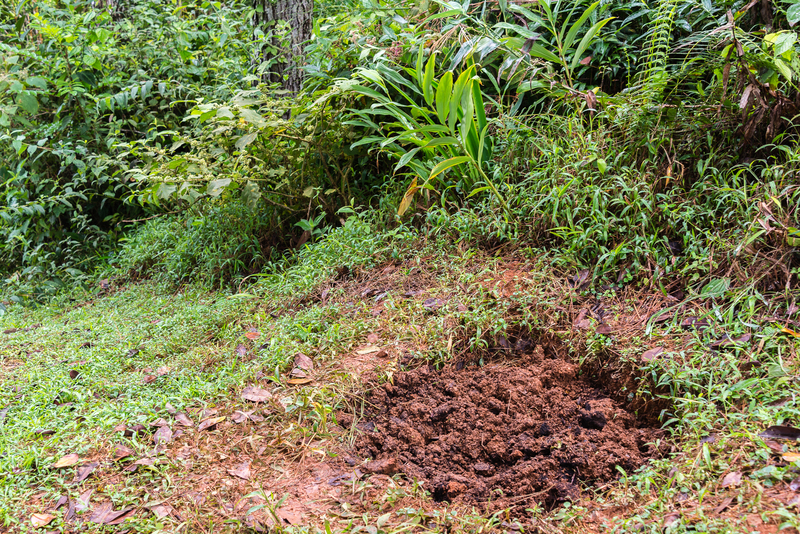 Our little area in the jungle has a poor quality of soil. Even though it is heavy red clay, things grow quickly. The soil is difficult to work with for planting anything! So, we decided a couple of years ago to begin composting, in hopes that augmenting the soil would be helpful in improving its quality. A simple four-foot hole in the back yard received most of our kitchen waste. I rotated around the four quadrants of the compost hole, adding not only kitchen waste but some potting soil, peat moss, and sand. The kitchen waste decomposes quickly. Last trip, we had our large front deck tiled and had a small planter built into one of the corners. We used our composted soil to fill the planter. By the time we left, in March, everything we had planted was growing well. There were a number of small unidentifiable things starting to grow. We thought they were weeds but according to our friend down the street they were tomatoes and papaya. We left them alone! 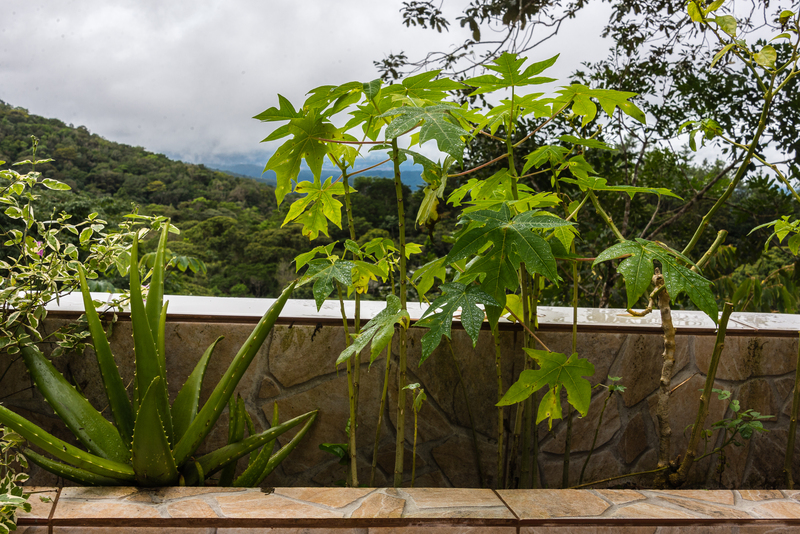 On our return, the planter was overgrown with not only the plants we had planted but many tomato and papaya plants. The papayas were now seedlings about eighteen inches tall. We love papaya and it grows well here if it has the right conditions. It likes full sun and good drainage. 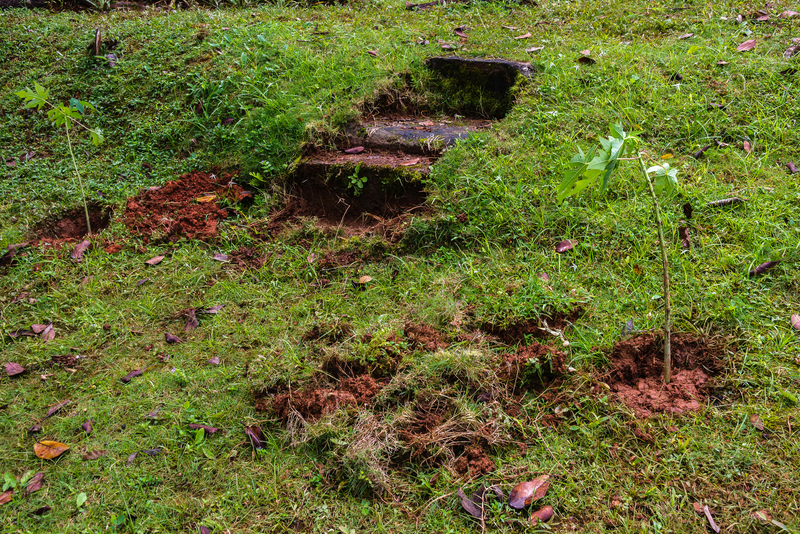 Our lot has now got more than a dozen papaya seedlings planted in various test places. We need to find locations that the plants like as it gets quite windy here in the dry season. Our planting attempted to offer sunny locations somewhat protected from the wind. We will see how successful we were. Papaya trees grow fast and die-hard! Even slightly cool temperatures can kill the tree. It doesn’t like shade, cold, drought or wind. It is between six and nine months from seed to first fruit, then production is ongoing. The single stalk tree grows up to thirty feet tall. OK, that’s seed to 30 foot maturity in six to nine months! You should be able to literally watch it grow. It only lasts about four years. It’s like it grows and produces so fast that it burns itself out! We are looking forward to seeing how prolific our papaya trees are. As they grow fruit, we will have to watch them carefully as the hungry birds will be doing the same. Yesterday, we took a trip that we probably should not have taken in our two-wheel drive Toyota Rav4. We went partway down the mountain to a small lake called Goofy Lake and turned left into a small housing community called Buena Vista. Many of the families living here work for Melo, a large chicken producer in the area. Melo provides their chicken farm workers with houses, however this man works in the incubating department so is not entitled to a house. 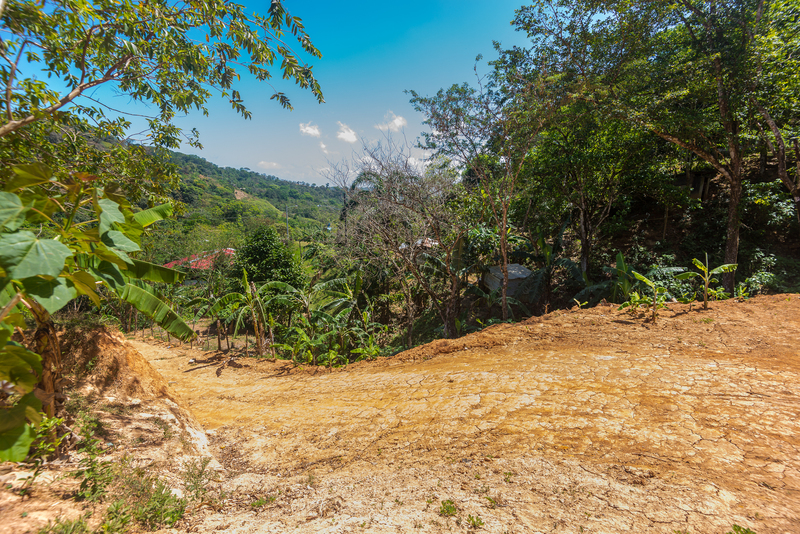 Until recently, we would have needed to hike in from the road to Panama City, but a new road is under construction by the government. It is not finished yet, but the packed gravel surface is currently passable and a huge improvement over its predecessor, a steep red clay dirt track that would become like a shiny skating rink after a good rain. Why are we here? 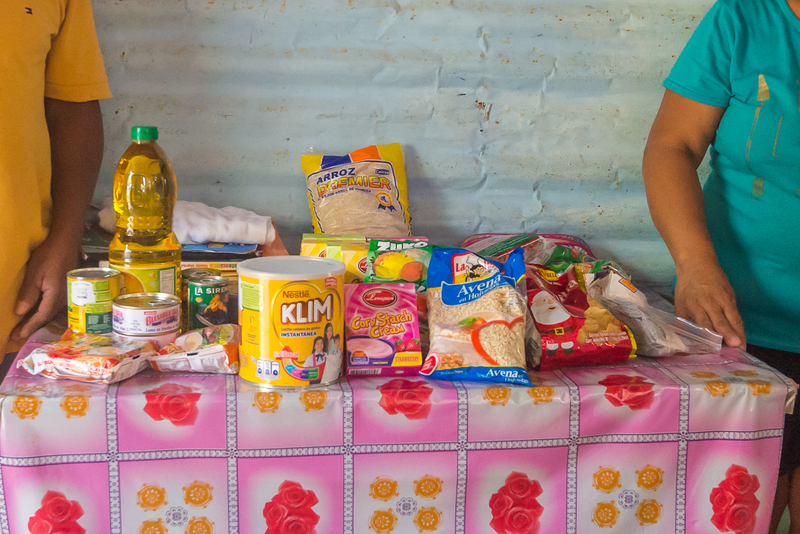 Well, our story goes back to Christmas time when the expat community in Los Altos de Cerro Azul give money to provide food baskets to some needy families. This year, as there was some money left over, it was decided to find another family that was in need and give them a food gift. In need indeed… This family of five have a fourteen year old son, Hector, who suffers from Cerebral Palsy and is bed ridden. The family cares for Hector as best they can. 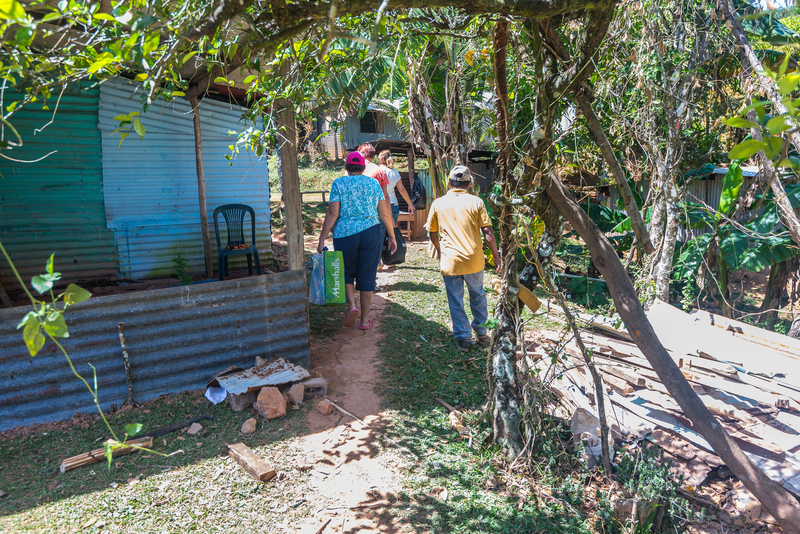 One of the difficulties they have is when Hector has a seizure and needs to go the hospital, people from the community must carry him out to the road to Panama City, as the ambulance cannot get to his house, due to the poor roads. The landscape in this area is incredibly beautiful and in stark contrast to the poor living conditions of most of the residents. 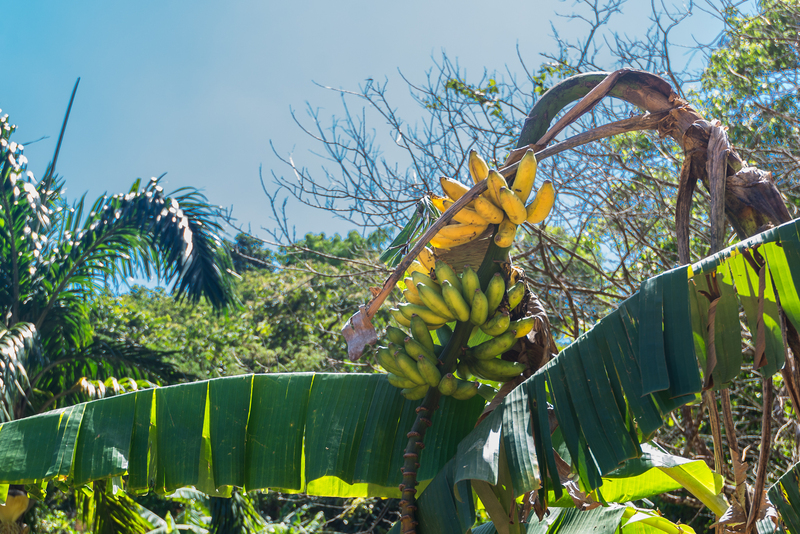 Bananas are growing everywhere. These are the working poor of Panama who are laborers employed at the lowest of wages. Even so, when we visited Hector and his family, everyone was dressed in their best, proudly showing us some of the coloring projects by the young girls and the small chicken house where a dozen or so chickens were contentedly pecking at the ground. It was satisfying to be able to contribute, in a small way, to the needs of this family. Oh, and the new government road will greatly improve access to the community for ambulances assisting Hector from time to time. Do you like Fireworks? 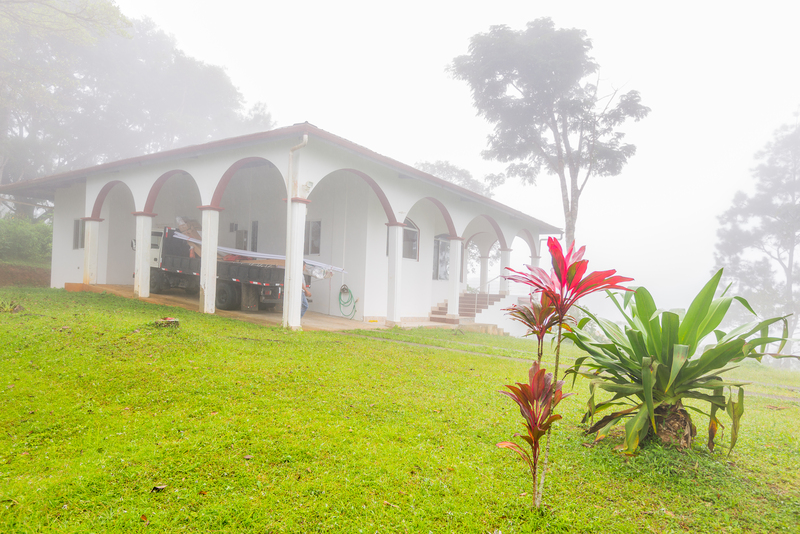 Need a place to go to escape the cold weather? Then let me recommend a place where the sun is hot, breezes are warm, and the ocean waves will ease you into a stress free existence. We are in Coronado, Panama! This is an established well-known beautiful beach community with miles of beautiful black and white sand beaches, about two hours west of Panama City. It is a popular place, as the traffic volume on the Inter American Highway will confirm. People love to escape the city and get to the beach. We had friends visiting Panama and staying in Coronado who invited us to spend a few days with them over the New Year Holliday. We have been here before but not during the New Year’s celebrations. We came out a few days before the holiday to miss out on the huge traffic jam that occur when Panama City evacuates for a holiday weekend. Traffic from the City on the Inter American Highway was still heavy on New Year’s Eve, running bumper to bumper for miles from the City. It began to ease around 10PM. 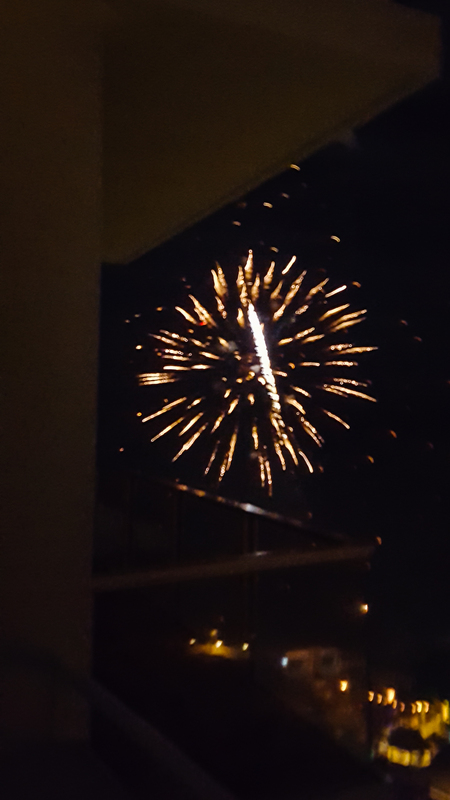 Panamanians love their Fireworks! They are legal here and are used on every possible occasion. Weddings, birthdays, graduations, and any other conceivable occasion are all excuses to load up on Fireworks and set them off for everyone in the vicinity to see. We are here on New Year’s Eve! Fireworks began around dusk with short bursts of pyrotechnics from various parts of the town. It was like they were unable to wait for the New Year, or maybe they were just testing them to be sure they could let them off properly. Not knowing exactly what to expect, we thought that this might be the way it was done here. Not terribly impressive! At the turn of the New Year, things changed! The whole city lit up with some very heavy-duty fireworks. This is not the small stuff you might expect but rather large professional expensive rockets. The beach in front of our apartment building was one of many launch sites throughout town that was releasing large noisy and bright displays of fireworks. We are on the 20th floor of a concrete building and you could feel the loud deafening blasts on the building. Dogs for miles started howling and most of the car alarms in the parking lots within a block or so started going off. If you panned the horizon, you would see fireworks being launched from houses all over Coronado. It went on for around 45 minutes! I don’t know how much all of this would cost but it would not be cheap! I have seen lots of fireworks displays in my lifetime, but never a show so large, so long, and so elaborate. Well done Coronado! So next time you want something really special, keep New Years in Coronado in mind. You won’t be disappointed. Well, here we are back in Panama for another season. I am a bit late with this update as we actually arrived on the 2nd of November and will stay through about the end of March. My excuse for not posting earlier is that we have been busy! I’m going to stick with that! We have three projects planned for this year. Figure out and build/buy/install a railing system for the outside deck. Now this may not seem like that much work to do in 5 months but keep in mind that this is Panama where everything seems to take longer than expected. Oh and did I mention we have a hard timeline as we start getting visitors right after Christmas. Last year we could not get our workers until late February. They were busy with other projects, so for this year we booked a 1 December start with them before we left. They actually started a little early, on 20 November. Now this all sounds pretty good but we had not picked tile or come up with the design for the bathroom tilework. Once again we made the rounds of the tile places and tried to find something that was to our liking. We were also shopping for the tile for the outside deck work at the same time. Eventually we found a stonework pattern tile that we liked for the outside decks. Our first estimate was that we needed just about 100 square meters. The next problem… delivery! Our first thought was to just throw it into the Rav and drive it back up the mountain. 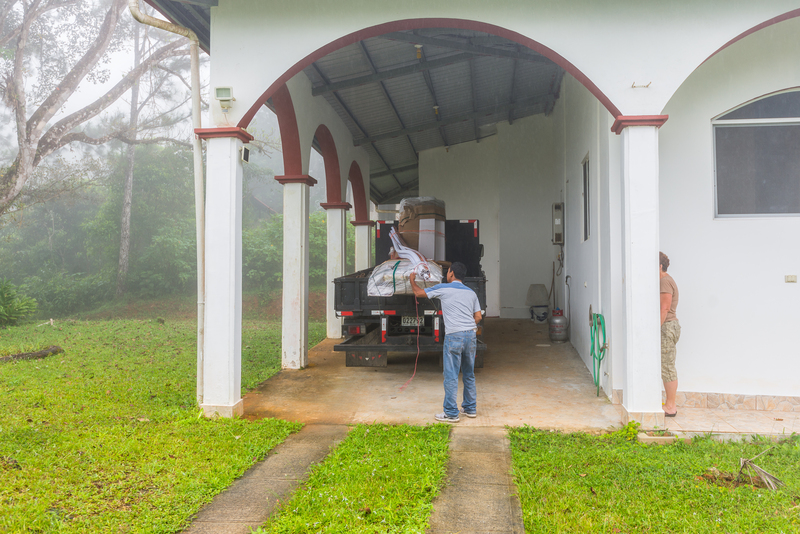 After all, it would be the Panamanian way… if it fits you load it up and go. Something didn’t seem right about that so I checked and found that each box weighed about 75 pounds. This meant that the total payload would be just over 3,000 pounds… way too much for one trip with the Rav, we would need three. We talked with the store and they got us a quote and made the arrangements for a 4×4 pick-up truck to haul the load up the mountain to us. It arrived, all in one load! According to the Internet, the payload for a Toyota Hilux 4×4 is about 2,000 pounds. All 3,000 pounds arrived on a single load! The next tile purchase was from the store where we bought our tile for the rest of the house. We needed about another 100 square meters of tile to complete the bathroom walls and shower. We ordered the tile, mortar, and grout and asked about delivery. Now, if you remember our last delivery from this supplier resulted in a five ton truck, grossly overloaded along with an inexperienced driver that could not make it up the hills once into the park. This was a company owned truck with a driver and three swampers, who were all needed to unload and reload parts of the load due to the inability of the driver to get the rig up the hill. It seems that the store has learned something! The truck they hired to take the load to us was a privately owned truck, operated by the owner. He was a very capable driver and had no difficulty getting to our house and unloading, all by himself. No swampers needed when you know what you are doing. Keeping in mind that it is still the rainy season here, we will start the inside work. 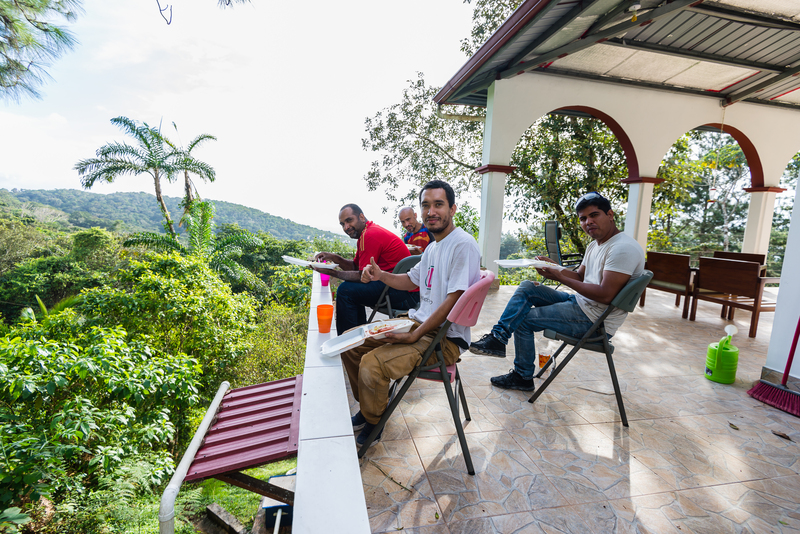 Our workers, Sebastian and Pablo, worked for us last year and are meticulous tile workers. The unfinished bathroom was quite dark as there was only a small window. We decided to knock a hole in the outside wall and put in glass blocks to let some light in. The room is quite large as it also is our laundry, with a stacked washer and dryer. It will be large enough for a three-piece band, when we have a party. Here are a few photos of the progress. The white tile makes the room quite bright, with the new window. Once the vanity and toilet are installed, I will update the photos to show the finished job. 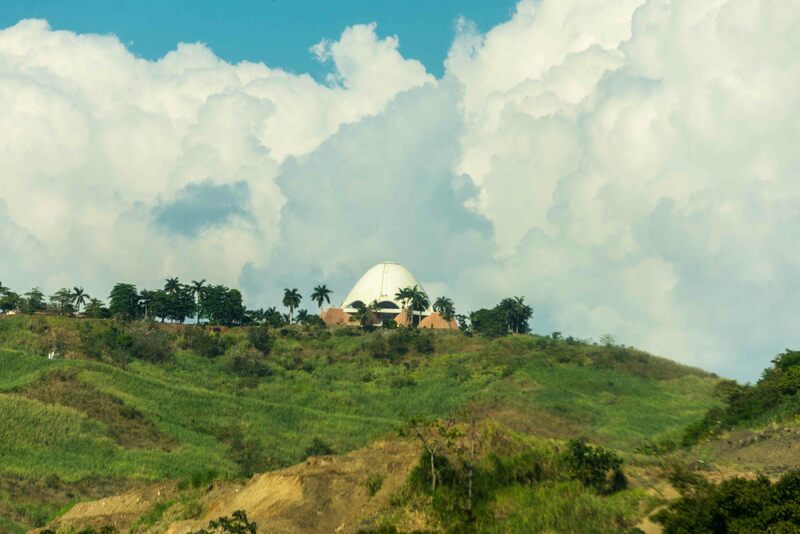 Each time we bump and wind our way up and down the mountain, we pass a Panamanian Public School called E.B.G. Juan E. Jimenez. There is no ability to speed as a rough tight hairpin curve just at the entrance to the school keeps things under control. 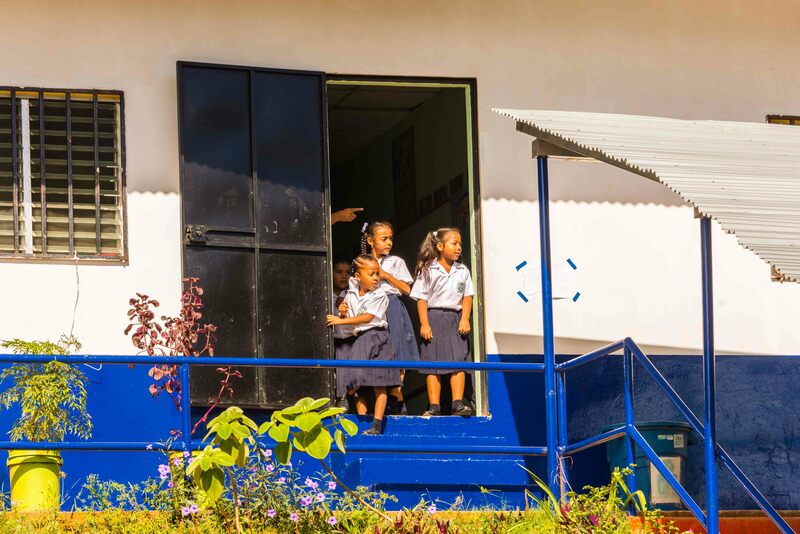 We have never had the chance to see this school close up until today when a charity, called “Maria Luisa de Moreno Fundacion Internacional” will have a team there to give some of the less fortunate kids a small package of school supplies. 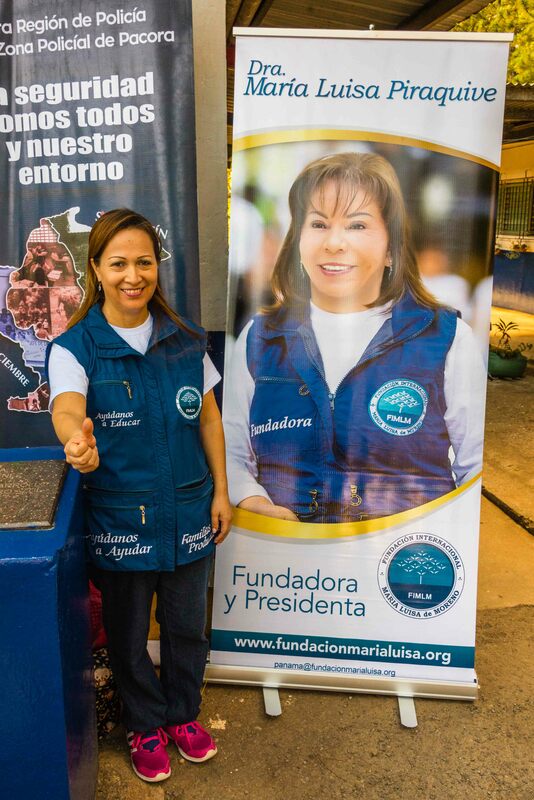 The Maria Luisa de Moreno Fundacion Internacional is a Colombia based non-profit organization formed in 2000 by Doctor María Luisa Piraquive. The Fundacion is currently present in 16 countries with three strategic lines focused on education, social welfare and productivity. We got to attend because the National Police asked our local “Vecinos Vigilantes” (Neighbourhood Watch) group to attend. We were asked to bring something for the kids. Cup-cakes, which are becoming our defacto standard offering, were approved by the organizers as long as they had no icing. I guess they didn’t want to have to clean up the kids after they ate their cup-cakes. In Panama, these kind of events are strongly supported by the National Police. They use opportunities like this to turn out and help, support, and speak encouraging words to the kids reminding them to call on police for help and stay away from drugs. This is the same community involvement approach we see with the police at home. It has proven quite successful. I admit to being somewhat confused about who was and was not selected to attend the function. While some kids were brought in from other locations, some were from the E.B.G. Juan E. Jimenez School. There were also classes not participating in the event. From time to time, you would catch a small curious student looking out the door of their classroom, to see what they were missing. I caught a class getting ready to head out to the garden area. They were drawing tools from a storage locker which they used during a class in the field. Here, as it is a rural area, the kids learn how to plant and grow food. The beautiful blooming flowers around the school buildings are a complement to their abilities. I was told that each class had their own area of the garden to plant and keep up. This was a fascinating event for me to cover, howbeit much too long for the age of the kids attending. Too many lengthy speeches by too many people! The kids showed expected signs of restlessness toward the end of the several hour program. Some were paying close attention, while others seemed distracted by most anything. I must say that North American kids would be hard pressed to behave that well for that length of time. The payoff, which came at the end of the speeches, was the handing out of the school supplies, which came with a sucker and a cup cake! I now completely understand why we had been requested not to put icing on the cup-cakes. 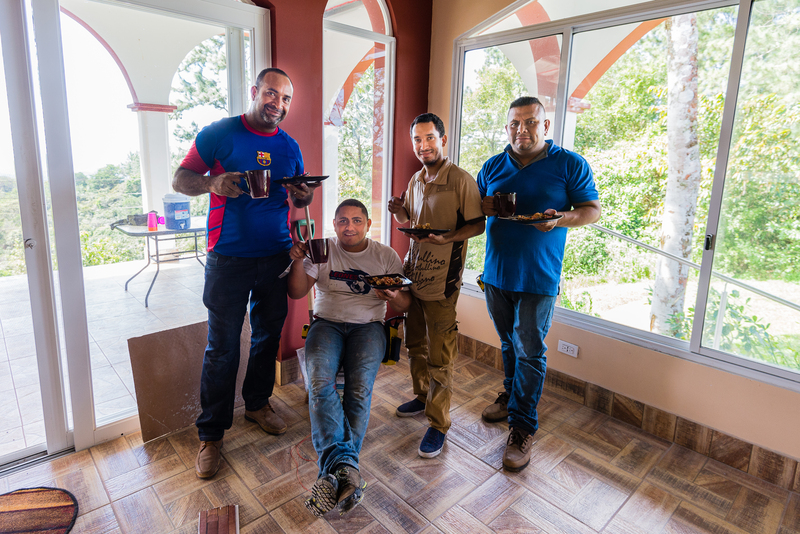 As we approach the end of our stay in Panama for another year, I thought you might be interested in some of the work that we had done on our house during our visit. Last year, during the rainy season, the people staying in our house identified some water problems. Here, in the rainy season (April through November), water can really come down. This is not a bad thing as long as you and your house are properly prepared for the volume. Also, the mud is like in Edmonton. You get taller as you walk through it! There were some areas of concern that were prioritized for our visit this year. Our roof was not sealed well enough and there was a minor leak during heavy rains. This has been corrected and we find it much quieter when the wind blows as the roof caps are not exposed to catch the wind and whistle. Also, the dead leaves have stopped floating down from the roof during windy days. No need to rake the floor inside the house any more. Another concern was in the office. There is a sliding glass door there that is actually mounted too low. There is no way for the rain that hits the door and runs down and into the track, to drain so the floor in the office can get wet. The correct solution is to remove the door and remount it again higher and open the drain holes in the track to the outside. We will install ceramic tile outside on that patio so the height will increase. 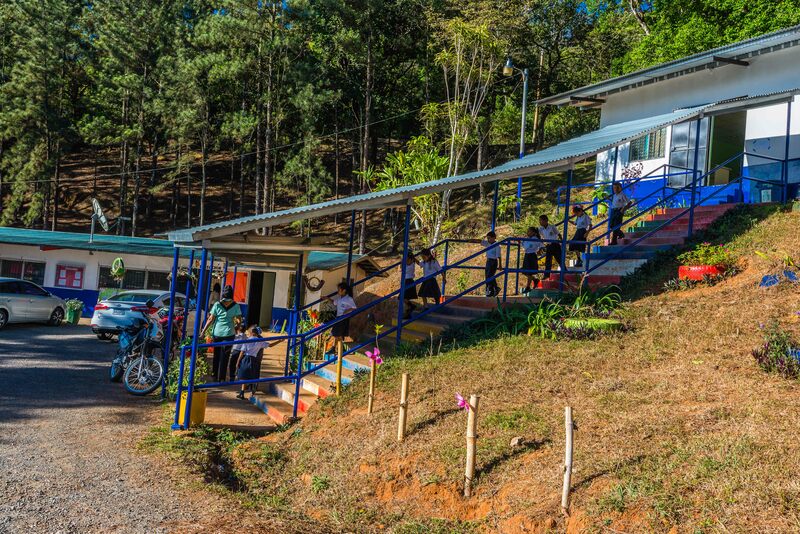 Once again, we are impressed with the ingenious solutions that our Panamanian workers come up with. Sebastian, who will lay the tile for us next year, suggested installing a small sloped trough across in front of the door, draining through the wall. This will give the water in the track a place to drain. We tested it by turning the hose on the outside the glass door and found that the inside stayed dry. Impressive and lots less work than raising the door. Last year, our lower level under the front deck, got quite a bit of water into it. The water was coming through the concrete wall and eventually pooled in the middle of the room. Our investigation showed that there was a hole outside the house, just at the place where the water came in. The outside drainage had run into the hole and into the house. This side of the house is a problem as the ground slopes toward the house. The side of the house is also badly stained from the heavy rain splashing the mud up on the house. 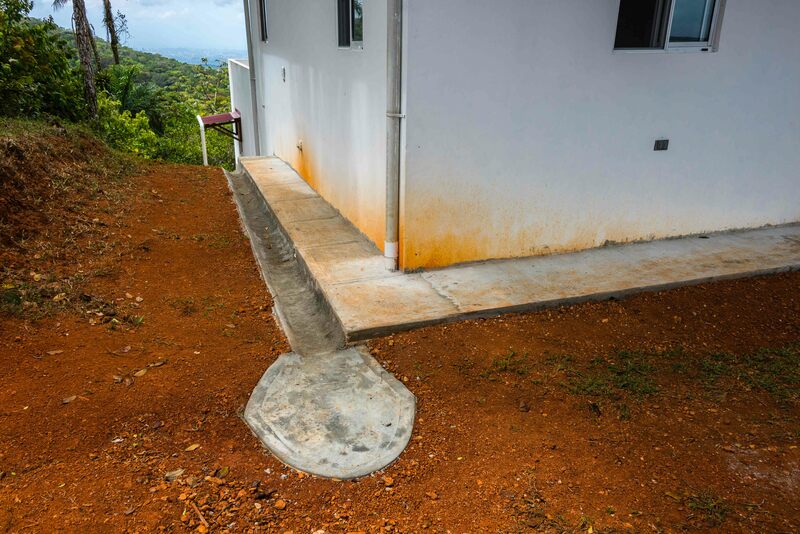 It is also difficult to walk down the side of the house due to the steep slope of the ground. Our solution was a series of things. First we build a narrow sloped sidewalk out from the house. This will improve access as well as keep the rain from staining the house when it hits the mud. 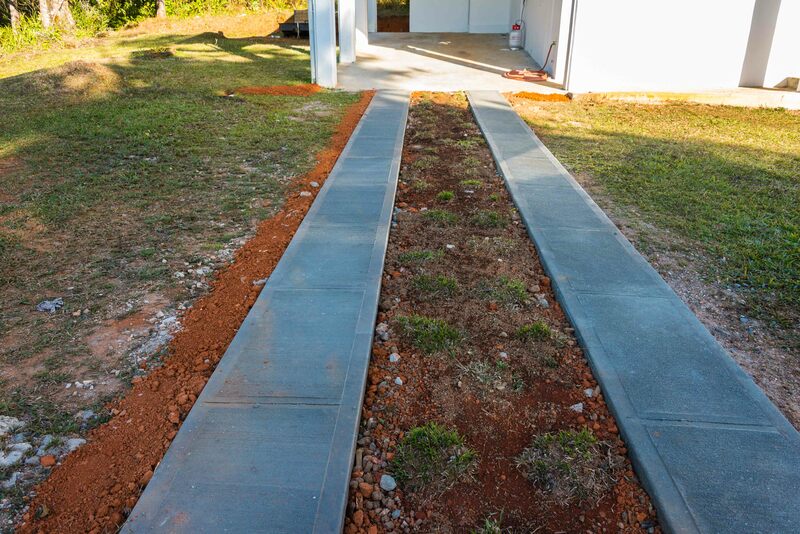 Next to the sidewalk, we built a small open concrete trench from the top of the house all the way to the bottom. Downspouts were extended and now drain into the trough as does the surface drainage from the sloped ground beside the house. We think this will solve our problem with water in the downstairs area as well as improve access and protect the house from mud staining. 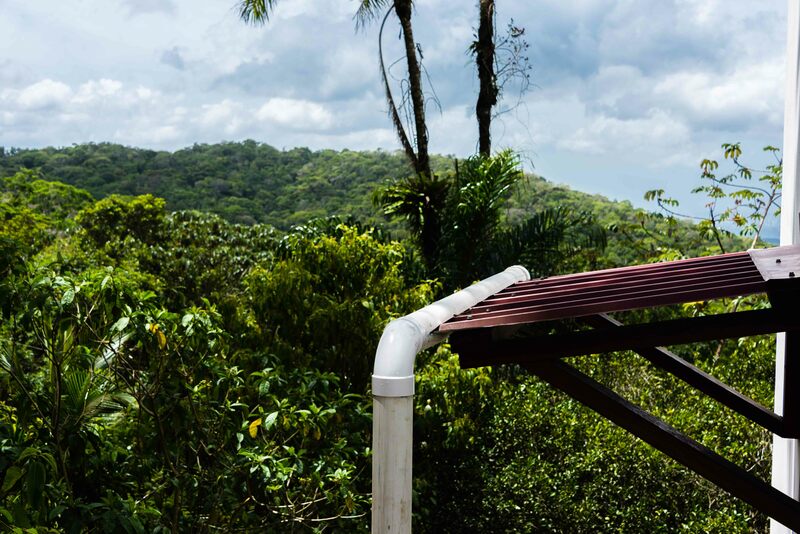 We installed a Panamanian eves trough on a small roof. 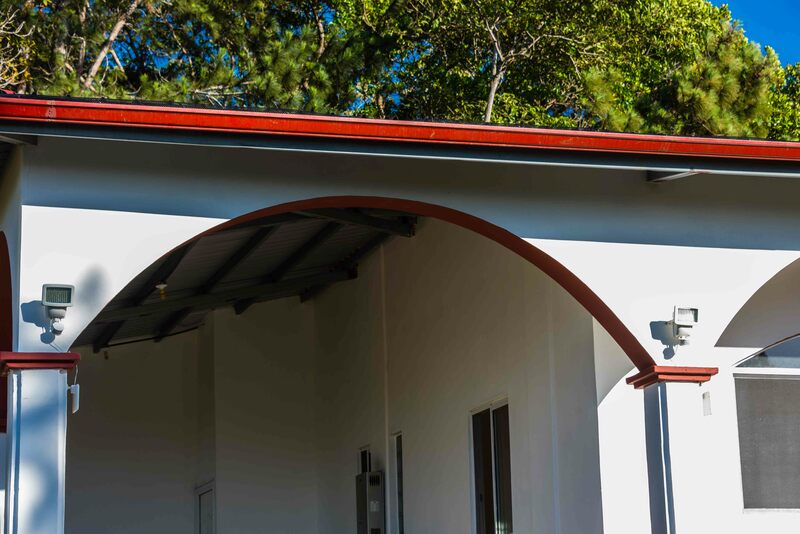 Interesting… take a three inch plastic pipe and cut a slot the length of the roof then slide it over the edge of the roof and put a downspout on it. They love plastic pipe here! 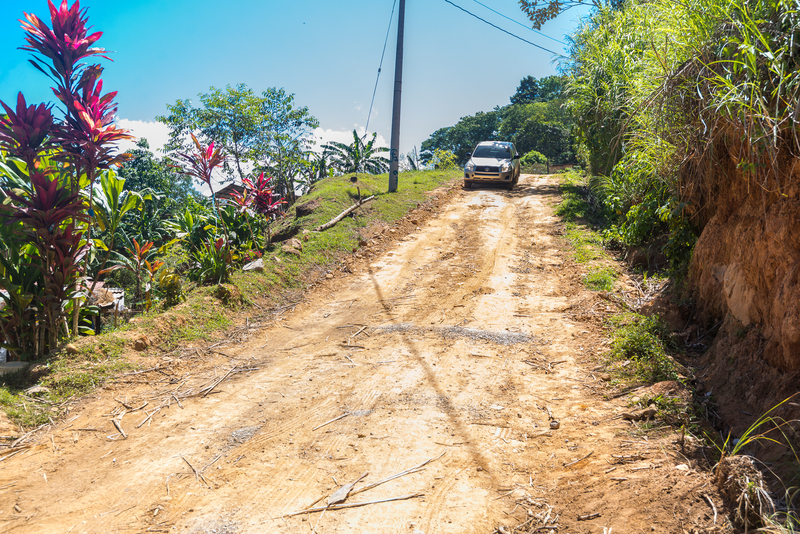 We have added a driveway this year as during the rainy season vehicles pick up mud between the end of the road and the carport. We learned that grass is planted as plugs of grass rather than seed. Seed disappears as soon as the birds find it. We also added some yard lighting with a couple of high intensity LED lights on motion sensors. It works pretty well to light the outside when people leave or approach the house. We also got our interior doors this year. We had them made at a shop about 45 minutes away where all they do is make doors. We found it by accident while looking for another place that is no longer in business. They make everything out of Sour Cedar, which the bugs will leave alone. He even let us change the design and colors of a door he had, partly built, in the shop. Watching the installation was painful. They did use power tools but not the ones you would expect. The door had to have a small piece removed from the length. They used a power grinder with a wood disk. They use the tools they are most used to working with, even though we would use something else. It has been an interesting season! Infrastructure construction progress here has been spectacular. When we left last year in March 2016, evidence of the new Metro was limited to only a few traffic barriers and some large drills, taking core samples along the new route. When we returned in October 2016, the progress was amazing! Overhead guide way supports were well under construction with many of the precast guide ways already in place. The contractor is from Brazil and is currently being investigated for bribes in the millions of dollars. It occurred to me that you might find images from a drive across town to be of interest. 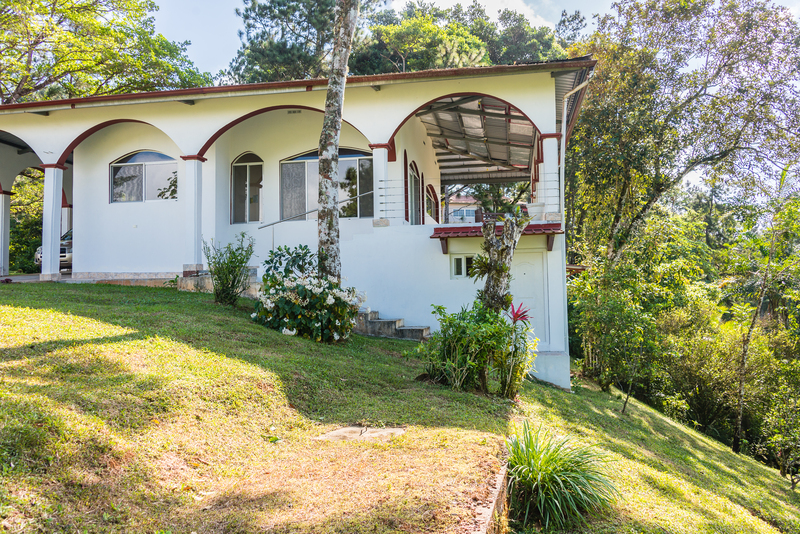 Here, in the city, you will find a varied terrain covered with homes, both new and old. Homes range from mountain homes to city dwellings. You will see jungle, modern multi-lane toll roads and old narrow winding single lane mountain roads. You will also see a few shots of the new Metro construction. Now, these photos are taken through the windshield of our car as it bumps and winds down the mountain and through the not too smooth roads in the city. Our route takes us down the mountain road to the main gate of our complex and further down the mountain from there. The road width and smoothness does improve, marginally, as we descend. We take a shortcut that takes us past a shopping center and that has our favorite fruit stand at the side of the road. A right turn will take us on to the Interamerican highway, currently construction bound with unpredictable traffic. In a short while, we begin to see some of the new Metro construction but turn on to one of the two main toll roads to cross the city. They are called Corredor Sud (south) and Corredor Norte (north). Our trip takes us across the city on Corredor Norte. Part way through our trip on the top of a hill, we see the Bahai Temple, one of only nine in the world. It looks like an egg. It is a beautiful place with a great view of the city. Some of the older homes are built on the hillsides in the area close to the temple. We got some entertainment at a red traffic light. Rather than just begging, you will often find entertainers that hop out into the stopped traffic to perform something while you are delayed. This time it was a juggler. Just before the traffic starts up again, they walk down the line of traffic hoping for a tip or two. Unique. 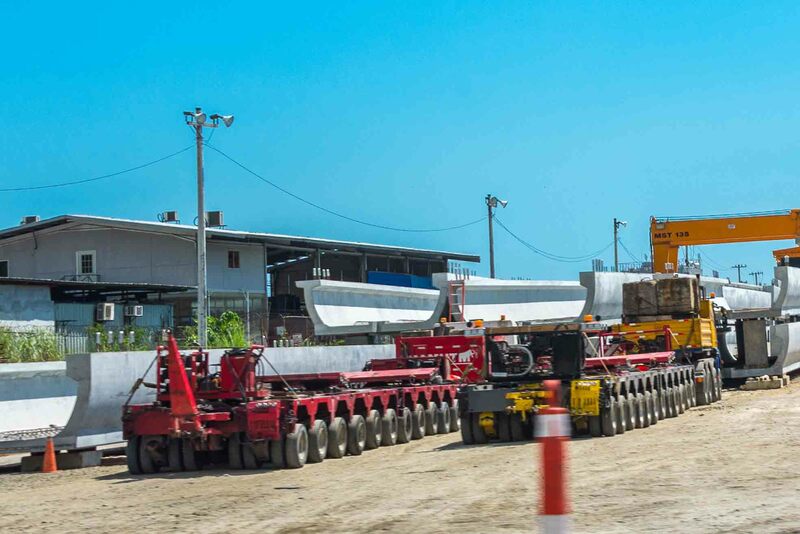 We also pass the massive precast plant where the new Metro guide ways are created and stored until the construction calls for their installation. Much of the terrain here is undeveloped jungle. It is hard to recognize that you are still in the city. We exit the toll road at Via Centenario (Centennial) and continue on, to the exit just before the Centennial Bridge, and head north on Avenida Gaillard to the Gamboa turnoff. This is a popular biking route and it is common so see groups of riders, all decked out in cycling gear, on the road. We also see cyclers riding up our mountain. That takes them from sea level to an altitude of about 700 meters in the space of around 20 kilometers. Now that’s hard work! Turning toward Gamboa, we are in a National Park. We proceed along a jungle lined cement two lane not too smooth roadway that takes us over the summit, where you will find a large popular Zoo. 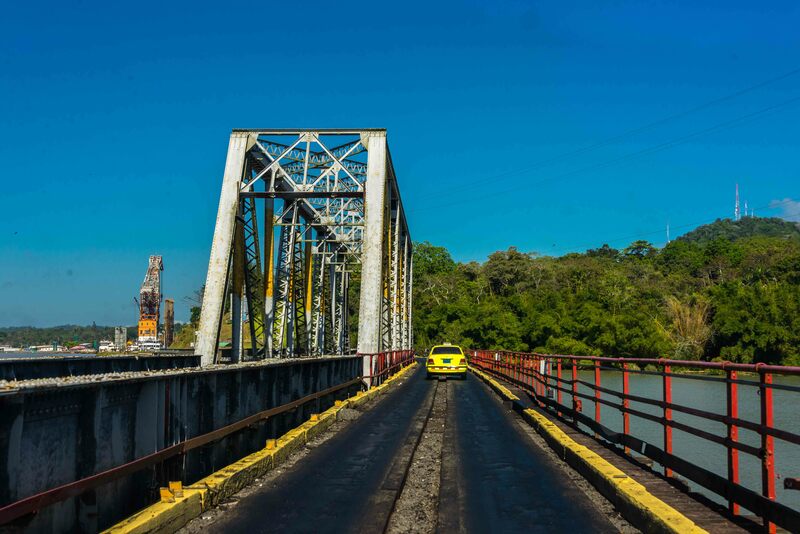 Continuing on about 10 kilometers, we come to a single bridge which also has track for the Panama Canal Railway. Shortly before the bridge, we pass the prison that houses Manual Noriega, the infamous Panamanian President come drug lord. Crossing the bridge we find the small town of Gamboa. This location is about half way through the canal and is the base for the dredging division of the canal. Here, you will also find the Rainforest Resort, which is a pretty expensive, beautifully located hotel in a remote place right on the shores of the Chagress River. They have a restaurant right on the Chagress River, which is worthwhile for lunch. Our return is over the same route. One way will take you about 1.5 hours driving time. Tolls for the round trip will run you about six dollars. Hope you enjoyed! 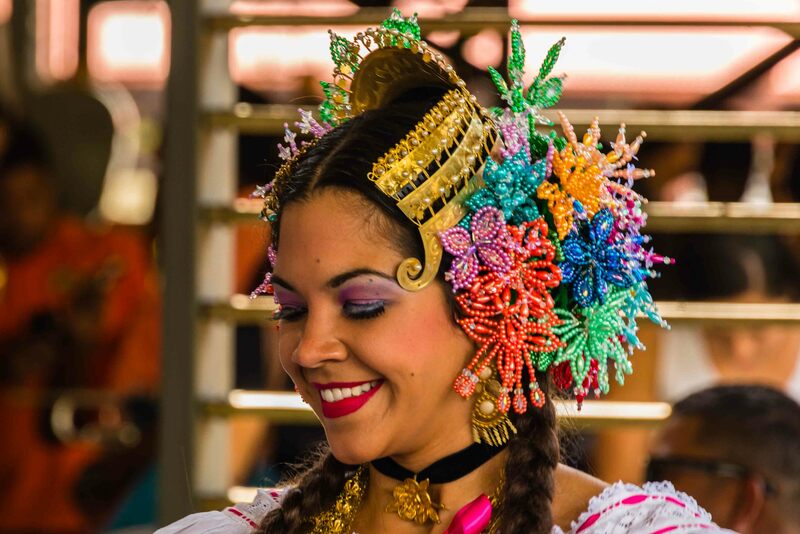 Carnival in Panama is celebrated with the same revelry and abandon as New Orleans or Rio de Janeiro. Celebrated in Panama since the early 1900’s, this big party begins in the four days before Ash Wednesday. This year the celebration started on the 25th of February. During this time, very little business happens as most businesses are closed. It is like the Calgary Stampede! People leave the city for the interior of the country where the intense partying occurs. Oh and they choose a Carnival Queen. 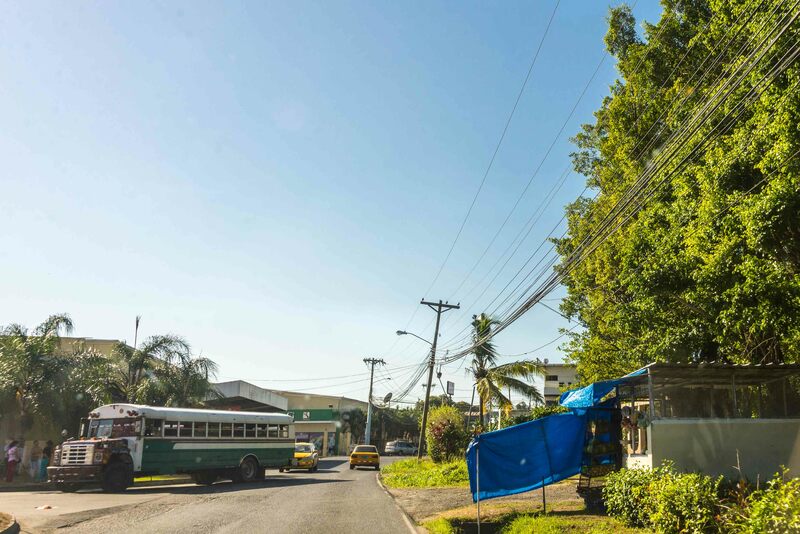 A town called Las Tablas with a population of around 9,000 is the center of activities. Penonome is also a popular place to party. 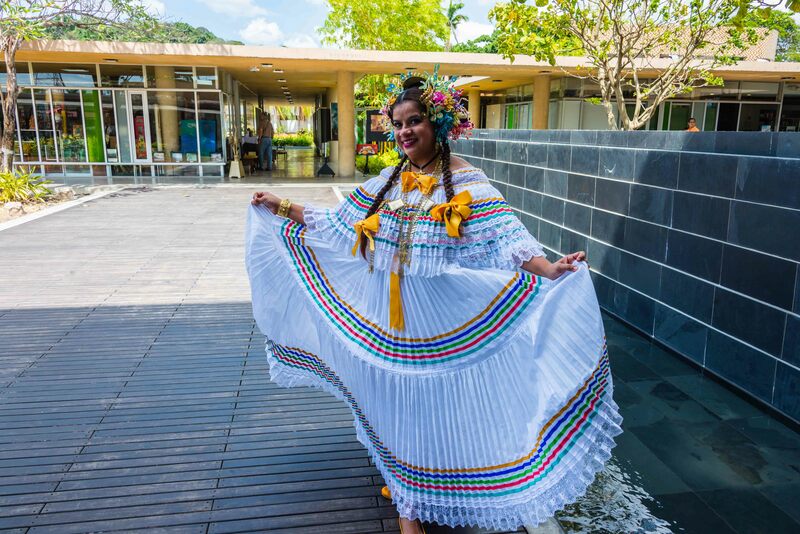 Interestingly, Panama City is not a big player in Carnival with most celebrations limited to locally organized street fairs and neighborhood parties. What can you expect at one of these parties? You will find live or recorded music played through speakers as big as a Mac truck that will almost break your ear drums. A stage in an open area, usually a flat deck trailer. Lots of people in various states of intoxication and dancing! I mean intense dancing with lots of water. Llots of water because you get hot in 35C weather when you are dancing in a frenzy all day. Usually the water comes from a truck and trailer like the fuel tankers that deliver to your service station, full of water with someone on top hosing down the crowd! Having been in the business, I don’t want to think of what was in the trailer before the water or after! Now we typically stay clear of the big celebrations but there is a great benefit that comes from this celebration. Panama City is like an abandoned city. You can get pretty much anywhere during Carnival without any concern for traffic. It is great for sightseeing popular spots that are normally difficult to get to due to traffic. 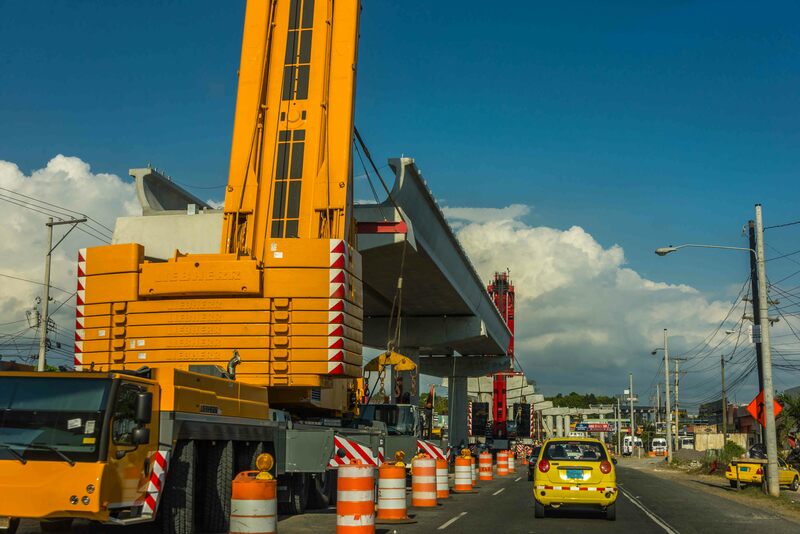 Just stay away from the Interamerican Highway on the first and last day of the party, when many of the 1.5 million people try to return to Panama City. Can you say traffic jam? Here are some images of entertainers, in traditional dress, performing at the City of Knowledge just before Carnival. It gives you a flavor for the celebration and the costumes you would see as part of the Carnival Queen crowning.